I may have to add that to my list! I'd like to add more international authors, so this could be just the thing. I enjoyed The Girl With the Dragon Tattoo, but the last two were not ones that I enjoyed as much (which makes sense since Larsson actually died in 2004 and the original plan was for this to be a ten book series – thus, not much editing and revisions could be done).I do enjoy Scandinavian writing so I will definitely check out the devil's star soon. Something about those swirling wind and snowy conditions just makes me think: "crime!" :)Hope you are doing well and staying warm in Chicago, Bellezza. I'm glad to see this is so good, because it's the one Nesbo book I own! Elizabeth, the minute a book gets lots of hype is the minute I decide I probably won't read it. Lots and lots of classics call my name now; I'm so often disappointed in what's been recently written. This book was exciting, though.Simplerpasttimes, aren't international authors the best?! They give us such a glimpse into another world than our own.Coffee and a book chick, I haven't read the other two in Larsson's trilogy, even though I own them, because I was so disappointed in the first. The only thing I remember, the only thing I even vaguely liked, was the character of the Girl. I'm intrigued as to what moves her, who she is. If you like swirling wind and winter conditions, you should read Smilla's Sense of Snow, too.Shannyn, I haven't read too much of Dorothy Sayers, but I'd like to read more! Give Nesbo a try, see if you like him. There are some fairly violent parts, though.Bermudaonion, this is the third book he's written; I've heard great things about the first two, too! You've done it again, Bellezz. You've captured my attention, this time with Nesbø. This sounds so interesting, but the "gory" part is putting me off. You know my feelings on "The Girl." 😦 But thanks, as always, for your review! Suko, glad to help! :)Col, not nearly as gory as that awful part in the The Girl With The Dragon Tattoo near the end. Not nearly. This has a much faster pace, a better conclusion, and is just a better mystery, in my opinion. I've been looking at this at my local shop(half price sale) & umming & arhhing about whether to get & add it to my evergrowing TBR. Might take another look, thanks……… I think.ParrishPs, WorldBook Night on march 5th, & I've been chosen as a giver & will just under 50 worldbook night copies of David Mitchell's Cloud Atlas to hand out to the general populous, all on the night. Parrish, tell me more! How does one enter said give-away? Are you in charge to give away all 50, or are you one of the 50? How fun, either way. I think you'll like the devil's star, and how can you lose at half price? Entry was through the worldbook night website, which was mentioned on a Tv prog – The Culture Show way back end of last year, beginning if this. The idea of Worldbook night is in the night, to give away a million books. I'll will be given a box of books at the end of February, which wool be mine to hand out to whoever I want on that day, although when I volunteered I said my target group was the students of my area. The idea of the,night is to promote reading & literature, there is a website for more info.Parrish. It's funny how some authors get all the attention while others get very little yet deserve it all the more. I hope those readers who enjoyed Larsson's books will pick this one up based on your recommendation!Thanks for being a part of the tour. I have not yet read Larssons' trilogy…crazy, I know. I will add this one to my list because it has all of the layers that I love in a book. Thank you for recommending. Did this book really remind you of Larsson?I didn't get that feeling (my review http://manoflabook.com/wp/?p=991), I actually thought Nesbø writes better even though the book certainly wasn't as original or hard hitting as Larsson's Millennium series. This book reminded me of Larsson's work only in that they're both Scandinavian crime writers. Did you see this line in my post? 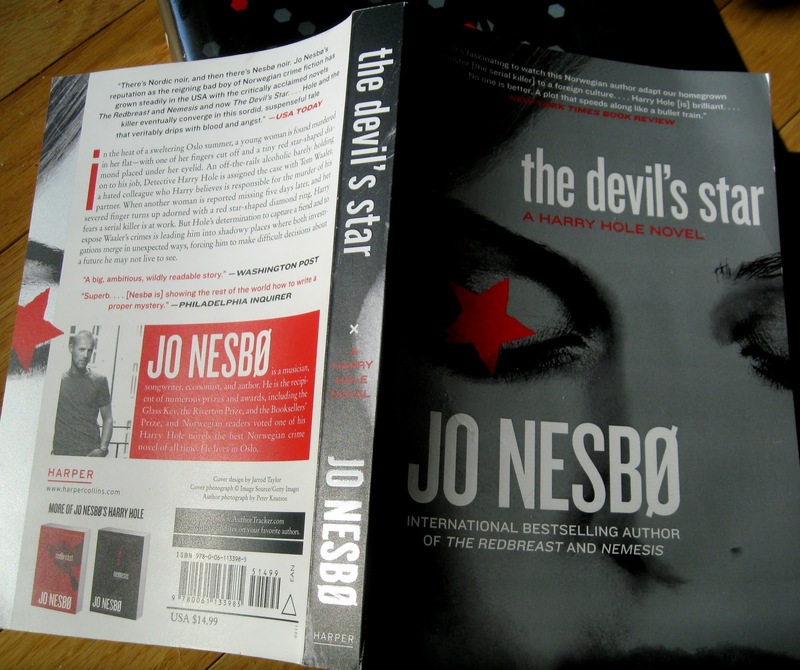 "In all the hullabaloo about Scandinavian crime writers, one must face the fact that for many, Nesbø does it best." I'd definitely agree with you that Nesbø is a far better writer. I even find myself thinking longer and harder about The Devil's Star than I did The Girl With The Dragon Tattoo. Which I can't even remember very well right now.Thanks for visiting; I'm off to see your blog.